When I started my blog, I wanted to keep my blog simple and stylish. However, it’s been two weeks, and all I did was making it look simple (honestly, I got rid of everything except menu and the title of my blog. so empty and barren here.) My excuse is that I am still getting used with this blog. Also, I guess I need to pay some $$ to add pictures and details to make my blog pretty. I haven’t decided whether I want to purchase items for this place, but I wonder what if I could move this tab to here and put this there for better usability. Understanding Facebook’s EdgeRank | Social Media Today. Backlinks vs. Content – What’s Best For Your Website? There was a time when your website’s content – or your website’s content keywords – were the presiding factor to bringing traffic to your site and pushing you up to the top of the search engine listings. Then Google began to preside over the internet and it decided backlinks were the best way to calculate if your site was good or not, and by association determine your search engine position. Of course what goes around comes around and more recently backlinks have fallen out of favor and content has become fashionable once again. LinkedIn just delivered another strong earnings performance. This chart provides a break down of where its revenue comes from. It’s split between Talent Solutions, which are tools for corporate recruiters, Marketing Solutions, which is advertising and job listings, and Premium subscriptions, which are sold to salespeople and job seekers to make connections. I received an email today that my Linked In profile was in the top 5% viewed profiles of 2012. I’ve appreciated the importance of Linked In for a number of years now and I’ve always kept it up to date. I’ve recently updated it, and included my most recent experience and the top achieving projects which I have been involved with throughout my career so far. My personal philosophy is just be as human as possible. The human element is really what makes it successful. Consumers want to communicate with the brand and feel like they’re apart of the company. They have questions and comments, it’s not a one-way street. I believe in listening more than speaking. I really like to see the inner-relationship come out and have them be apart of the company’s DNA. It’s also important to have people in place who are passionate about your brand, they need to be the biggest fans of all. Be original, measure everything, connect with your fans, and take risks. Stay on top of new trends but master what you already know, and learn what content your consumers are clamoring for. Another waitress sees the message on the check, takes a picture of it and posts it to Reddit. Thus begins a social media firestorm leading to the firing of the waitress who posted the picture and making Applebees social media team pull all-nighters for several days. “How long does it take you to write 150 words? An hour… two? How about 5 minutes? Welcome to the world of speed writing. As the name suggests, speed writing is producing writing much faster than you are used to. It’s about trying to blast out as much text as possible against the clock. This is not about typing faster… it’s not typing speed that slows most people down. If you’re a student and have ever had to write Reports, Essays or Theses, you will have had to reference what you have used in your report. If you mention something that someone else has written, you need to give them credit by referencing them. The Harvard Referencing System is one of the preferred layouts for these references. It is a relatively strict way of arranging the bibliographical information. This tool takes in the raw information – author, title, year of publication – and creates the reference in the correct form. Είναι πολύ ευχάριστο να ζεσταινόμαστε το χειμώνα από την φωτιά, με μια ξυλόσομπα ή τζάκι! Από αυτή τη φυσική ζέστη φωτίζεται το σπίτι, ψήνεται το φαγητό, στεγνώνονται τα ρούχα, ζεσταίνεται το νερό, και φυσικά μένει στο τέλος η πολύτιμη στάχτη! Δεν πετάμε την στάχτη, δεν είναι καθόλου άχρηστη ή σκουπίδι. Συνεχίζουμε να την χρησιμοποιούμε, όπως έκαναν και παλιά και αυτό μας κάνει να νοιώθουμε απερίγραπτη χαρά! 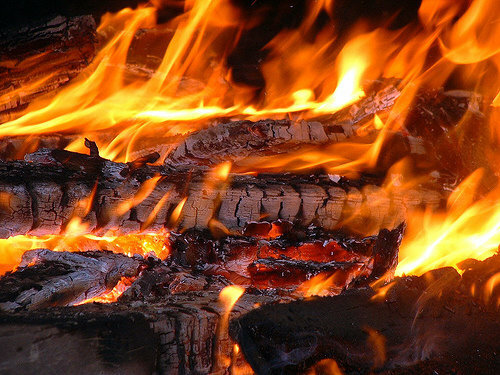 <a href=”http://www.tweetyblogs.gr&#8221; title=”Tweety Blogs” target=”_blank”>Tweety Blogs</a><br />Το μοναδικό στο ελληνικό web με ζωντανή ροή ενημέρωσης, αποκλειστικά από Βlogs ! Greece: Class warfare, banksters and money laundering (video). An American oil company sends a man to Scotland to buy up an entire village where they want to build a refinery. But things don’t go as expected. Here is an amusing info graph from Business Insider that was released along with advertisements for their upcoming IGNITION conference, a 2 day conference exploring the successful and emerging business models of digital media. The info graph makes some interesting connections between “online content that grabs us” and the rise of consumer willingness to pay for that content. I like the graph because it is a good reminder of what to keep in mind when updating your online content, whether it be your company’s website, social media, newsletter, or other online communication. >>Be relevant. Provide readers, customers and window shoppers alike, with useful information. >>Make your design attractive. Choose a stylish theme and stick with that theme throughout. Because you are dealing with a visual medium, your content should be visually compelling. Pictures. Pictures. Pictures. Fear is directly proportional to the size of the coward. Are you frightened by crawling creatures? Does the sudden sight of a scurrying mouse startle you? Does the wayward flight of a random cockroach make you duck? Would the sight of a black spider resting on the wall across the room fill you with terror just after you turn on the light in your bedroom? If so, have you ever asked yourself why? Why would you, a human, the most fearsome animal on the planet be terrified of such tiny crawling creatures? Curiously, the same behavior exists in giants of religion (Christianity fears Atheism) politics (GOP vs. Democrats) and even technology (Apple Inc. vs Samsung et al). Why do giants fear dwarves? This post explores the psychology of giants like Apple Inc. Apple fan boys won’t be amused. Is technology sapping children’s creativity? The Washington Post recently published an article on the impact technology can have on a child’s development of creativity. The technology revolution has sparked a new debate about just how much parents should allow their young children to play with iPads, iPhones and other devices. Here’s a smart look at the issue by early childhood development expert Nancy Carlsson-Paige, a professor emerita of education at Lesley University in Cambridge, Ma., when she won the Embracing the Legacy Award from the Robert F. Kennedy Children’s Action Corps for work over several decades on behalf of children and families. Carlsson-Paige is author of “ Taking Back Childhood” and the mother of two artist sons, Matt and Kyle Damon. Over the past decade, lots of big newspaper companies have gone bust. HAVE YOU CLAIMED YOUR LOCAL BUSINESS LISTING ON THESE 21 SITES? These sites are great for building local authority, they’re also a factor in how search engines determine your local listing placement. This site was launched in 2006 and in February of 2009 integrated Facebook Connect onsite. The site boasts 4 million consumer reviews, over 27,000 local deals, and a domain authority of 78. Quantcast measures the traffic at an estimated 678,000 site visitors per month. Kudzu is a fairly well known site so it might already be on your radar, but if not it’s certainly worth a look. Recently coming out of beta, LikeList.com is a “social-local referral service” with more than 510,000 business “like’s” in the system. LikeList has more than 2 million friend relationships on their current user base. NeatStat.com estimates their monthly traffic at about 20,000 visitors. Just recently the site launched Sharelists – “A collaborative list for groups of people with interests or tastes in common to share what they like and help each other”. Touting itself as “your local guide”, OpenList.com was founded in 2003 in Seattle. Initially the site just focused on restaurants, hotels and attraction listings. Today it is open to all businesses. A domain authority of 44 and site traffic estimates from NeatState.com at 2.5 million a month, the site has seen incredible growth since 2003. To get on this site you’ll likely need to submit toLocaleze and eventually will get added to the site. Or inquire on their site here. Helping users find the right business, MatchPoint.com has been around since 2007. In Vertical Measures’ post “10 Good Citations You Can Get Right Now” we featured MatchPoint in 2009, and the sites value still holds true. Quantcast estimates monthly traffic at 12,000 visitors, which in comparison to other sites is quite small. MatchPoint, however, offers free business listings and additional advertising options like most of the sites on this list so they are worth a look. Jayde isn’t so much a local search site per se, it’s more so a B2B and business search engine that’s been around for many years. You’ve probably heard about it; the site has been around since 1996. Quantcast estimates traffic at 13,600 visitors a month, and domain authority on the site is 76. YellowBot lets you “do. tag. write. share.” since 2006. With an average of 744,000 visitors a month, the site stays active and is fairly authoritative with a domain authority score of 61. They also offer international versions of YellowBot for Canadians and users inBermuda. Tip: Add a variety of tags to your listings for better optimization. MacRae’s Blue Book is America’s original industrial directory since 1893. Today with more than 1 million active users monthly, the site can help users find the industrial and manufacturing products and services they’re looking for. They have a wide array of categories your listing can fit into, and they offer free listings. Helping online users find coupons and local businesses is what Zidster is all about. With an estimated half a million visitors a month (according to NeatStat.com), the site has grown in popularity since launching in 2007-2008.
iBegin provides businesses in the US and Canada with listings for free, and helps users find your businesses through their incredibly easy to use local search site. The site has been around since 2006, and since then has grown to an estimated 1.5 million visitor per month site (according to NeatStat.com). This popular site once talked about by many local search experts is still alive and kicking, allowing businesses to claim listings, respond to reviews, and create deals for their prospective customers. The site averages a whopping 5.8 million visitors a month. If you still haven’t found the time to claim your listing – do it today! Tip: Use the coupon functionality on MerchantCircle to get more traction with your weekly/monthly deals. Get found online with Match Local. A fairly new site online, their parent company Matchbin has been around for quite awhile revolutionizing the traditional media industry. NeatStat.com estimates MatchLocal’s traffic at a few thousand visitors a month. While the site still has some growing to do, it’s yet another place to get a listing for your business. Do your due diligence when finding sites to add your business listing to. It might seem daunting, especially after you’ve added your listing to the hundreds of sites already out there. Tip: Set aside an hour or two hours a month to look for new sites to list your business on. Search for niche local search sites that are specific to your area. Below I’ve listed a few that I’ve found that have a decent amount of traffic on a monthly basis and are fairly authoritative. Tip: Use advanced search commands like “local keyword directory” “city/state” “claim listing” or “local keyword” “city/state” “submit business listing” to find sites specific to your location. Or –try these search commands in Rand Fishkin’s post. Find and edit your listing today! Add your business for free today! Over 8,000 local marketplaces including ShopPaloAlto.com, ShopBuffalo.com, & ShopCorona.com. Additionally, business owners should look to place listings on sites that are specific to their industry. Whether you’re a local restaurant, doctor, hospital or even an accountant, there are industry specific sites your business should have a listing on. Tip: Use advanced search commands like “industry keyword directory” “city/state” “claim listing” or “industry keyword” “city/state” “submit business listing” to find sites specific to your industry. Add your restaurant for free today! Network of rating sites allowing users to review accountants, camps, child care, mechanics, therapists, and more. Explore the list of sites in the Ratingz Network today! A local search site dedicated to small businesses. The site has over 30 million business listings! IF ELGIN VISITED YOUR COUNTRY! MacRumors is now hearing that pre-orders may not begin tomorrow following the media event and that they may instead start on Friday morning in a scenario similar to last year’s debut. We’re hearing that certain portions of Apple’s sales support team are significantly increasing their staffing levels beginning at 6:00 AM Eastern on Friday, with a major surge for the initial shift beginning at that time and a sustained level of high staffing for at least the remainder of the day. As noted, such a timeline would be very similar to the launch and pre-order schedule of last years iPhone 4S model. 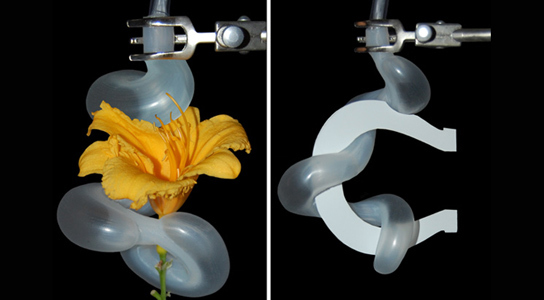 Typically, robotic hands have had trouble being dexterous enough and delicate enough to perform certain tasks, but robotics experts from Harvard University have been developing a series of soft robots, capable of accomplishing much more than previously. Facebook might be the biggest social network, but LinkedIn is clearly the stock market’s darling. While Facebook has been in the news recently for its dropping share price (which perhaps is not a fair reflection of future possibilities as I write in this earlier post), LinkedIn has been quietly going about its job. It has been announcing a slew of features. These include new company pages, notifications, new mobile features, and Outlook integration. Launching today is our new notifications feature, which will keep you notified in real-time when someone likes what you’ve shared on LinkedIn, views your profile, accepts your invitation, and much more. Get notified: We will keep you notified in real-time when someone likes what you’ve shared on LinkedIn, views your profile, accepts your invitation, and much more. With glass gone weather is in, so along deterioration begins…. Samsung, which has been locked in an ongoing series of high-stakes patent trials with Apple Inc. (NASDAQ: AAPL), has previously threatened to sue the iPhone maker if it were to release LTE-enabled products. Well, the new iPhone 5 is expected to be unveiled at a press event in San Francisco tomorrow, and the next-generation smartphone is reported to have long-term evolution (LTE) connectivity. 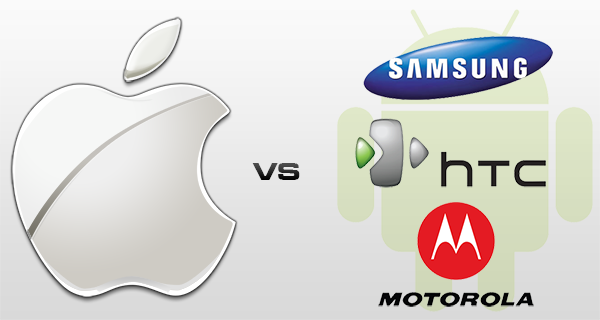 It’s true that Samsung Electronics has decided to take immediate legal action against the Cupertino-based Apple. Countries in Europe and even the United States — Apple’s home-turf — are our primary targets. Industry insiders say Apple’s next iPhone will work with some but not all 4G LTE networks in the United States and other countries when it is released. Moody’s said today that budget negotiations during the 2013 congressional legislative session likely will determine the direction of the U.S. government’s Aaa rating and negative outlook. If those negotiations lead to specific policies that produce a stabilization and then downward trend in the ratio of federal debt to GDP over the medium term, the rating will likely be affirmed and the outlook returned to stable … If those negotiations fail to produce such policies, however, Moody’s would expect to lower the rating, probably to Aa1. Τον περασμένο Φεβρουάριο τέσσερις ελληνικές εταιρείεςπαραγωγής εξοπλισμού για φωτοβολταϊκά κατέθεσαν πρόταση θέσπισης συγκεκριμένων οικονομικών κινήτρων για τους επενδυτές που θα επιλέγουν εγχώρια προϊόντα. Συγκεκριμένα, οι εταιρείεςExelGroup, Heliosphera, Alumil καιNOE/Aluset, είχαν ζητήσει υψηλότερη εγγυημένη τιμή στα έργα που χρησιμοποιούν ευρωπαϊκά προϊόντα σε ποσοστό άνω του 70%, σύμφωνα με το ιταλικό πρότυποπου προβλέπει 3 λεπτά επιπλέον ανά Κιλοβατώρα ενέργειας. Κι αυτό γιατί καθίστανται μη βιώσιμες εξαιτίας του κινεζικού ανταγωνισμού (διαβάστε περισσότερα εδώ). Ανακοίνωση για το θέμα εξέδωσε και Σύνδεσμος Ελληνικών Βιομηχανιών Φωτοβολταϊκών (ΣΕΒΦΩ), ο οποίος διέψευσε την ανάθεση της γνωμοδότησης στο δικηγορικό γραφείο “Μεταξάς & Συνεργάτες”. Τάχθηκε επίσης υπέρ της θέσπισης μπόνους στον ευρωπαϊκό εξοπλισμό κάνοντας μνεία στα προβλήματα που αντιμετωπίζει ο κλάδος (μείωση εγγυημένων τιμών, κινεζικός ανταγωνισμός κλπ). In the past three months, the global recovery, which was not strong to start with, has shown signs of further weakness. Financial market and sovereign stress in the euro area periphery have ratcheted up, close to end-2011 levels. 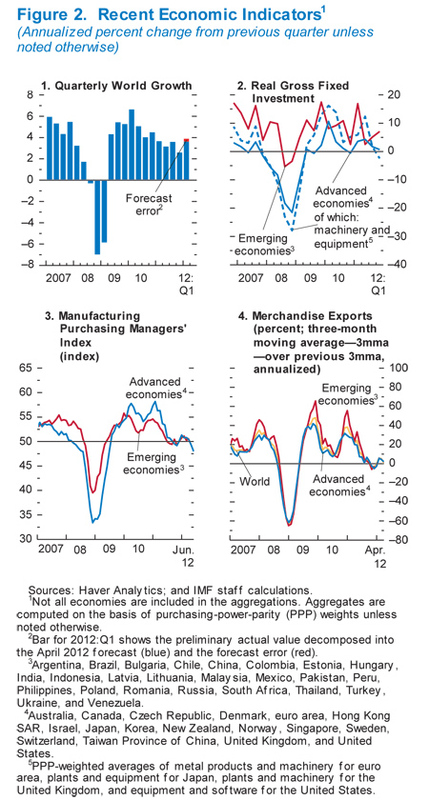 Growth in a number of major emerging market economies has been lower than forecast. 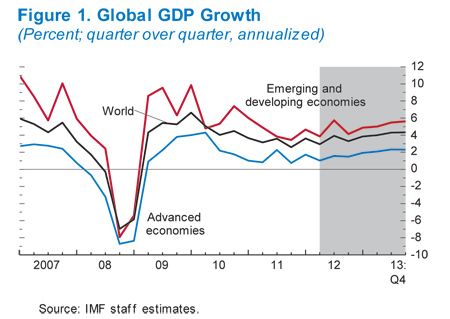 Partly because of a somewhat better-than-expected first quarter, the revised baseline projections in this WEO Update suggest that these developments will only result in a minor setback to the global outlook, with global growth at 3.5 percent in 2012 and 3.9 percent in 2013, marginally lower than in the April 2012 World Economic Outlook. These forecasts, however, are predicated on two important assumptions: that there will be sufficient policy action to allow financial conditions in the euro area periphery to ease gradually and that recent policy easing in emerging market economies will gain traction. Clearly, downside risks continue to loom large, importantly reflecting risks of delayed or insufficient policy action. In Europe, the measures announced at the European Union (EU) leaders’ summit in June are steps in the right direction. The very recent, renewed deterioration of sovereign debt markets underscores that timely implementation of these measures, together with further progress on banking and fiscal union, must be a priority. In the United States, avoiding the fiscal cliff, promptly raising the debt ceiling, and developing a medium-term fiscal plan are of the essence. In emerging market economies, policymakers should be ready to cope with trade declines and the high volatility of capital flows. Global growth increased to 3.6 percent (seasonally adjusted annual rate) in the first quarter of 2012, surprising on the upside by some ¼ percentage point compared with the forecasts presented in the April 2012 World Economic Outlook (Figure 1: CSV|PDF, Table 1). The upward surprise was partly due to temporary factors, among them easing financial conditions and recovering confidence in response to the European Central Bank‘s (ECB’s) longer-term refinancing operations (LTROs). Global trade rebounded in parallel with industrial production in the first quarter of 2012, which, in turn, benefited trade-oriented economies, notably Germany and those in Asia. For Asia, growth was also pulled up by a greater-than-anticipated rebound in industrial production, spurred by the restart of supply chains disrupted by the Thai floods in late 2011, and stronger-than-expected domestic demand in Japan. Excluding Russia 6.0 6.2 4.5 4.5 –0.1 –0.1 . . . . . . . . .
Middle East and North Africa 5.0 3.5 5.5 3.7 1.3 0.0 . . . . . . . . .
Sub-Saharan Africa 5.3 5.2 5.4 5.3 –0.1 0.0 . . . . . . . . .
World Trade Volume (goods and services) 12.8 5.9 3.8 5.1 –0.3 –0.5 . . . . . . . . .
Advanced Economies 11.5 4.4 1.9 4.2 0.0 0.1 . . . . . . . . . Emerging and Developing Economies 15.3 8.8 7.8 7.0 –0.6 –1.1 . . . . . . . . .
Advanced Economies 12.2 5.4 2.3 4.3 0.0 –0.3 . . . . . . . . . Emerging and Developing Economies 14.4 6.6 5.7 6.2 –0.9 –1.0 . 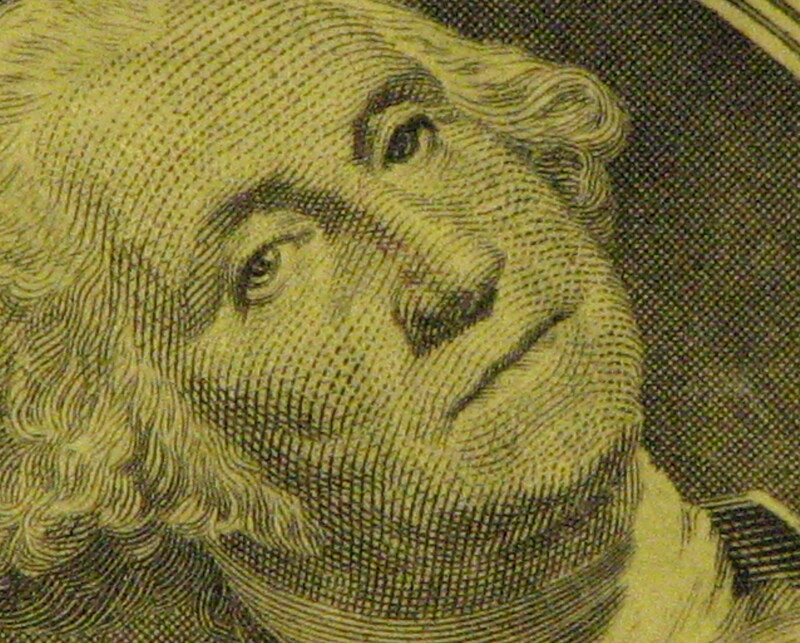 . . . . . . . .
On U.S. Dollar Deposits 0.5 0.5 0.8 0.8 0.0 0.0 . . . . . . . . .
On Euro Deposits 0.8 1.4 0.7 0.6 –0.1 –0.2 . . . . . . . . .
On Japanese Yen Deposits 0.4 0.3 0.4 0.3 –0.2 0.2 . . . . . . . . . Note: These forecasts incorporate information received through Friday, July 6, 2012. Real effective exchange rates are assumed to remain constant at the levels prevailing during May 7–June 4, 2012. When economies are not listed alphabetically, they are ordered on the basis of economic size. The aggregated quarterly data are seasonally adjusted. 1/The quarterly estimates and projections account for 90 percent of the world purchasing-power-parity weights. 2/Excludes the G7 and euro area countries. 3/The quarterly estimates and projections account for approximately 80 percent of the emerging and developing economies. 4/Indonesia, Malaysia, Philippines, Thailand, and Vietnam. 5/Simple average of prices of U.K. Brent, Dubai, and West Texas Intermediate crude oil. The average price of oil in U.S. dollars a barrel was $104.01 in 2011; the assumed price based on futures markets is $101.80 in 2012 and $94.16 in 2013. 6/Six-month rate for the United States and Japan. Three-month rate for the euro area. Developments during the second quarter, however, have been worse (Figure 2:CSV|PDF). Relatedly, job creation has been hampered, with unemployment remaining high in many advanced economies, especially among the young in the euro area periphery. The euro area periphery has been at the epicenter of a further escalation in financial market stress, triggered by increased political and financial uncertainty in Greece, banking sector problems in Spain, and doubts about governments’ ability to deliver on fiscal adjustment and reform as well as about the extent of partner countries’ willingness to help. Escalating stress in periphery economies has manifested itself along lines familiar from earlier episodes, including capital outflows, a renewed surge in sovereign yields (Figure 3: CSV|PDF), adverse feedback loops between sovereign stresses and banking sector funding problems, increases in Target 2 liabilities of periphery central banks, further bank deleveraging, and contraction in credit to the private sector. The stabilizing effects of the ECB’s LTROs in periphery financial markets have thus eroded. On the real side, leading economic indicators presage renewed contraction of activity in the euro area as a whole in the second quarter. Incoming data for the United States also suggest less robust growth than forecast in April. While distortions to seasonal adjustment and payback from the unusually mild winter explain some of the softening, there also seems to be an underlying loss of momentum. Negative spillovers from the euro area, limited so far, have been partially offset by falling long-term yields due to safe haven flows (see below). Growth momentum has also slowed in various emerging market economies, notably Brazil, China, and India. This partly reflects a weaker external environment, but domestic demand has also decelerated sharply in response to capacity constraints and policy tightening over the past year. Many emerging market economies have also been hit by increases in investor risk aversion and perceived growth uncertainty, which have led not only to equity price declines, but also to capital outflows and currency depreciation. In global financial markets (Figure 4: CSV|PDF), prices of risky assets declined during much of the second quarter, notably equity prices, while yields on safe haven bonds (Germany, Japan, Switzerland, and the United States) retreated to multidecade lows (see also the July 2012 Global Financial Stability Report Market Update). With some of the capital flows into perceived safe assets occurring within the euro area, the weakening of the euro has been limited. 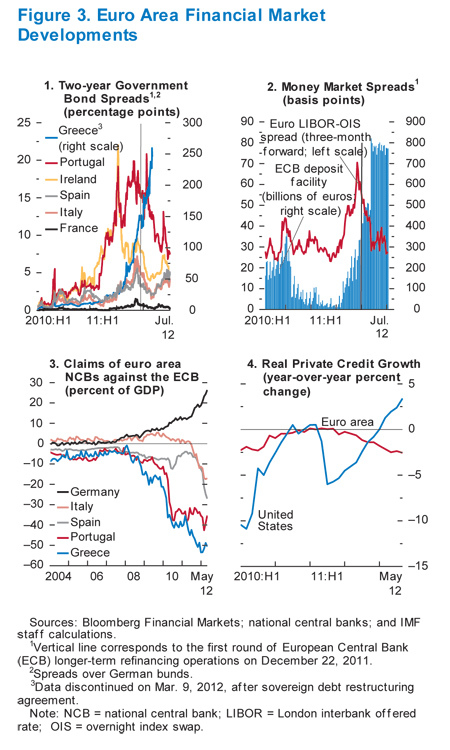 However, sovereign debt markets in the euro area periphery remain unsettled. Commodity prices have also fallen. Among major commodities, prices of crude oil declined the most in the second quarter—at about $86 a barrel, they are some 25 percent below their mid-March highs—given the combined effects of weaker global demand prospects, easing concerns about Iran-related geopolitical oil supply risks, and continued above-quota production by the Organization of Petroleum Exporting Countries (OPEC) members. The projections assume that financial conditions in the euro area periphery will gradually ease through 2013 from the levels reached in June this year, predicated on the assumption that policymakers will follow up on the positive decisions agreed upon at the June EU leaders’ summit and will take action as needed if conditions deteriorate further. The projections also assume that current legislation in the United States, which implies a mandatory sharp reduction in the federal budget deficit—the so-called fiscal cliff—will be modified so as to avoid a large fiscal contraction in the near term. Overall, global growth is projected to moderate to 3.5 percent in 2012 and 3.9 percent in 2013, some 0.1 and 0.2 percentage point, respectively, lower than forecast in the April 2012 WEO (Table 1). In view of a stronger-than-expected first quarter outcome, weaker global growth in the second half of 2012 will primarily affect annual growth in 2013 through base effects. Growth in advanced economies is projected to expand by 1.4 percent in 2012 and 1.9 percent in 2013, a downward revision of 0.2 percentage point for 2013 relative to theApril 2012 WEO. The downward revision mostly reflects weaker activity in the euro area, especially in the periphery economies, where the dampening effects from uncertainty and tighter financial conditions will be strongest. Owing mainly to negative spillovers, including from uncertainty, growth in most other advanced economies will also be slightly weaker, although lower oil prices will likely dampen these adverse effects. Growth in emerging and developing economies will moderate to 5.6 percent in 2012 before picking up to 5.9 percent in 2013, a downward revision of 0.1 and 0.2 percentage point in 2012 and 2013, respectively, relative to the April 2012 WEO. In the near term, activity in many emerging market economies is expected to be supported by the policy easing that began in late 2011 or early 2012 and, in net fuel importers, by lower oil prices, depending on the extent of the pass-through to domestic retail prices (which is often incomplete). Growth is projected to remain relatively weaker than in 2011 in regions connected more closely with the euro area (Central and Eastern Europe in particular). In contrast with the broad trends, growth in the Middle East and North Africa will be stronger in 2012–13 relative to last year, as key oil exporters continue to boost oil production and domestic demand while activity in Libya is rebounding rapidly after the unrest in 2011. Similarly, growth in sub-Saharan Africa is expected to remain robust in 2012–13, helped by the region’s relative insulation from external financial shocks, and revisions to the growth outlook since the April 2012 WEO are modest. Global consumer price inflation is projected to ease as demand softens and commodity prices recede. Overall, headline inflation is expected to slip from 4½ percent in the last quarter of 2011 to 3–3½ percent in 2012–13. In the short term, the main risk relates to the possibility of excessive fiscal tightening in the United States, given recent political gridlock. In the extreme, if policymakers fail to reach consensus on extending some temporary tax cuts and reversing deep automatic spending cuts, the U.S. structural fiscal deficit could decline by more than 4 percentage points of GDP in 2013. U.S. growth would then stall next year, with significant spillovers to the rest of the world. Moreover, delays in raising the federal debt ceiling could increase risks of financial market disruptions and a loss in consumer and business confidence. Another risk arises from insufficient progress in developing credible plans for medium-term fiscal consolidation in the United States and Japan—the flight to safety in global bond markets currently mitigates this risk. In the absence of policy action, medium-term public debt ratios would continue to move along unsustainable trajectories. As the global recovery advances, a lack of progress could trigger sharply higher sovereign borrowing costs in the United States and Japan as well as turbulence in the global bond and currency markets. Downside risks to growth in emerging market and developing economies seem primarily related to external factors in the near term. The slowdown in emerging market growth since mid-2011 has been partly the result of policy tightening in response to signs of overheating. But policies have been eased since, and this easing should gain traction in the second half of 2012. Nevertheless, concerns remain that potential growth in emerging market economies might be lower than expected. Growth in these economies has been above historical trends over the past decade or so, supported in part by financial deepening and rapid credit growth, which may well have generated overly optimistic expectations about potential growth. As a result, growth in emerging market economies could be lower than expected over the medium term, with a correspondingly smaller contribution to global growth. Also of concern are risks to financial stability after years of rapid credit growth in the current environment of weaker global growth, elevated risk aversion, and some signs of domestic strain. Among low-income countries, those dependent on aid face risks of lower-than-expected budget support from advanced economies, while commodity exporters are vulnerable to further erosion of commodity prices. In the medium term, there are tail risks of a hard landing in China, where investment spending could slow more sharply given overcapacity in a number of sectors. On the positive side, oil price risks have abated in recent months, reflecting the interaction of changes in prospective market conditions and perceived geopolitical risks. Supply conditions have improved due to increased production in Saudi Arabia and other key exporters, while demand prospects have weakened and are subject to downside risks. With geopolitical risks to oil supply widely perceived to have declined, risks to oil price projections appear more evenly balanced now, while those around prices of non-oil commodities tilt downward. The utmost priority is to resolve the crisis in the euro area. The recent agreements, if implemented in full, will help to break the adverse links between sovereigns and banks and create a banking union. In particular, once the agreed-upon single supervisory mechanism for euro area banks is established, the European Stability Mechanism (ESM) would be able to recapitalize banks directly. Moreover, ESM assistance will not carry seniority status for Spain—an important step to support market confidence. In addition, the leaders re-affirmed a willingness to consider secondary purchases of sovereign bonds by the European Financial Stability Facility (EFSF) and the ESM. A credible commitment toward a robust and complete monetary union. By setting in motion a process toward a unified supervisory framework, the European summit put in place the first building block of a banking union. But other necessary elements, including a pan-European deposit insurance guarantee scheme and bank resolution mechanism with common backstops, need to be added. In the shorter term, timely implementation will be essential, including through the ratification of the ESM by all members. In addition, these steps would usefully be complemented by plans for fiscal integration, as anticipated in the report of the “Four Presidents” submitted to the summit. The viability of the monetary union must also be supported by wide-ranging structural reforms throughout the euro area to raise growth and resolve intra-area current account imbalances. Demand support and crisis management are essential in the short term to cushion the impact of the region’s adjustment efforts and maintain orderly market conditions (as assumed in the baseline projections). There is room for monetary policy in the euro area to ease further. In addition, the ECB should ensure that its monetary support is transmitted effectively across the region and should continue to provide ample liquidity support to banks under sufficiently lenient conditions. This might require nonstandard measures, such as reactivation of the Securities Market Programme, additional LTROs with lower collateral requirements, or the introduction of QE-style asset purchases. Fiscal consolidation plans in the euro area must be implemented. In general, attention should be paid to meeting structural fiscal targets, rather than nominal targets that will likely be affected by economic conditions. Automatic stabilizers should thus be allowed to operate fully in economies not subject to market pressure. Considering the large downside risks, economies with limited fiscal vulnerability should stand ready to implement fiscal contingency measures if such risks materialize. In other major advanced economies, monetary policy also needs to respond effectively, including with further unconventional measures, to a much weaker near-term environment that will dampen price pressures. In view of somewhat weaker global growth, automatic stabilizers should be allowed to operate fully, while fiscal consolidation plans might need to be recalibrated if large downside risks materialize (see the July 2012 Fiscal Monitor Update). In the United States, it will be critical to reach transparent, bipartisan agreements to avoid a fiscal cliff in the near term and to raise the federal debt ceiling well ahead of the deadline (which will most likely be early in 2013). At the same time, both the United States and Japan need more credible plans to put medium-term government debt on a downward track. In Japan, a full Diet approval—after passage in the Lower House—of a gradual increase in the consumption tax rate is essential to maintain confidence in the authorities’ resolve to put public debt on a sustainable trajectory. In emerging and developing economies, policymakers should stand ready to adjust policies, given spillovers from weaker advanced economy prospects and slowing export growth and volatile capital flows. That said, the need for and the nature of the desirable policy response vary considerably across emerging market economies because of differences in their cyclical positions. In some, recent growth declines have primarily reflected normalization to trend, and policies must thus avoid rekindling overheating pressures, with due consideration of risks that potential growth could be lower than expected. However, in economies where inflation and credit pressures have already eased credibly or where inflation expectations remain firmly anchored, further cuts in policy rates could be considered to help alleviate weakening economic conditions. In economies where inflation and credit pressures have not eased significantly, targeted measures could be considered should bank liquidity or funding pressures arise in the context of the current unsettled global financial environment. Economies with sustainable public finances and market financing at sustainable rates should allow automatic stabilizers to play fully, while those with large fiscal and external surpluses could consider fiscal support. Finally, with growth slowing and after many years of rapid credit growth, enhanced risk-based prudential regulation and supervision and macroprudential measures that address financial risks should take top priority. David Harvey, theorist and author of Rebel Cities: From the Right to the City to the Urban Revolution, says that postwar capitalism can be understood with reference to the history of urbanisation and suburbanisation. Urban investment gets you out of a crisis but defines what the next crisis is going to look like, he argues. The emerging powers of the east are now in the midst of a massive urbanisation project and could fall victim to the same outcome. I ‘m going to assume that since you are at the About me section of my page you might want to know a little about me. I know i am supposed to let you know that i am a team player who has great enthusiasm for design, boatin or something. Well I’ d like to think that in life and work that is a given…I like to think myself as fun person who has the ability to find inpiration in the everyday. I have the passion and the outlook on the everyday to make it extraordinary!! !